Those of you that follow my column know I am a sucker for a good blend. In the United States we have a history of blending classic varietals, from jug wine to $200 Meritage blends. The French have Bordeaux and the Aussies have their classic GSM and Shiraz/Viognier blend. In all cases the combination of individual varietals often creates something greater then each component alone. In Italy, this classic combination is generically called "Super Tuscan". A blend of Sangiovese and Cabernet Sauvignon, this Italian gem has found a permanent place in my cellar. Each grape is allowed to show off its individual strengths in this wine. The Sangiovese brings red fruit and aromatics and the Cabernet brings structure and richness to the blend. Each grape unselfishly shows off the strengths of the other. Isn't that the way any good partnership succeeds? Tenute del Cabreo in a partnerhip of Ambrogio and Giovanni Folonari. This father and son team was formerly active in the family firm of Ruffino. 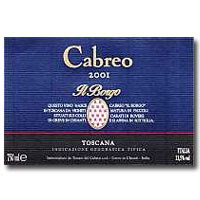 The family has been making notable wine since the 1700's, and Tunute del Cabreo is a venture launched in 2000. The focus of the Cabreo estate is Super Tuscan, but they have a portfolio of other Italian classics that have been well reviewed. Everything about this wine is well done. Even the bottle is premium. It is heavy and feels expensive. You assume before even opening the wine that you are in for a treat. The wine is fragrant, with lots of red fruit, red and black current, oak spice and surprisingly a bit of bacon fat. The flavor of black cherry, raspberry, black pepper and even some coffee are layered nicely in this wine. Big and full bodied, the wine is rich and elegant. Although the oak is obvious it is well integrated and actually adds to the profile. The finish is long and satisfying. This will stand up nicely to a big roast or rich fatty steak. You can drink this now, but be sure to decant it a few hours for best showing. It has the structure to age 10 years or more in the cellar. I look forward to seeing how this beauty evolves. This wine was around $50 when released. Although it is certainly worth the money, I seldom review wines in this price range and label it "value" wine. Value though, does not have to have a low price tag. It simply means you get more then you pay in satisfaction. This wine definitely qualifies. There are many $100 California Cabernet's and proprietary blends that would get a run for the money from this Italian classic. What if I told you that you could find this wine at $24.99? At that price, it is a screaming value. It is currently available in Pennsylvania at many of their Premium wine stores. As with all great values, there is limited supply. If you live in Pennsylvania, or within driving distance to any of their state stores, you can order on line and pick up at any of their locations convenient to you. Although they will not ship out of state, make the drive. This wine is a steal and will knock your sock off. Better yet, buy a case and drink it over the next 10 years. It is not often that I will review a French Bordeaux. I usually stick to what I know, which are Californian, Australian and Spanish wines. There was so much press about the esteemed 2005 vintage in Bordeaux, I had to explore some of the smaller (Read as more affordable) Chateaus to see what all the fuss was about. Robert Parker, wine critic and guru, wrote a great article on some of the smaller producers in Bordeaux. He called them the "Petite Chateau's", and discussed what wonderful values some of these wines represented. The point of his article is that the 2005 vintage was so strong, that the quality of all Bordeaux, even the smaller producers, was outstanding. I culled through his report, and chose 4-5 of the higher rated wines, with a price tag under $30. La Vieille Cure was the top ranked wine on the list that still fit my budget. Parker Loved this one. Initially tasted in the barrel before release, he gave it 89 points out of 100. When re-tasted, he was thrilled with the way that this had matured. He re scored this a 93 out of 100. This "upgrade" in score presents an interesting opportunity. Many wines are priced by the producers based upon these preliminary scores. Logically, the higher the score, the more the producer can expect to sell their wine in the marketplace. When a wine is scored below 90 points, there is a lot LESS interest in the wine from the general public. The wine is priced very reasonably to the importers and wholesalers, and the wine can then be sold at a much better price to the public. When a wine is re-tasted and the scores rise, more often then not the prices have already been set. These wines can sometimes fall through the cracks and represent a fabulous bargain to the wine loving public. This particular wine is a great example of this scenario. It is a fabulous wine, reasonably priced, that continues to fly under the radar of serious collectors. This wine poured out a beautiful deep inky red and coated the glass. It had aromas of sweet black fruit, black cherry, currants, and a bit of a sweet floral. It has wonderful mouth feel. Dense, Rich, concentrated, this wine tastes like a much more expensive bottle. The black fruit is superbly balanced and follows through to a long finish. It is a textbook example of what a fine Bordeaux should taste like. This is so incredibly delicious now, that you may not have the patience to let this wine age. I still think it is evolving in the bottle and will probably continue to for another year or so. It has the structure and balance to age gracefully for 10 to 15 years. This wine presents a rare opportunity for those of us that cannot stomach paying $125 and more for a good Bordeaux. You can find this on-line, and it is worthwhile buying what you can find. Fill a generous rocks glass with ice to chill the glass. Dump the ice after the glass is well chilled. Add the Tablespoon of Herbsaint to the glass and swirl completely around the glass to coat the bottom and sides. Pour out the excess Herbsainte. In a cocktail shaker, add 1 teaspoon of simple syrup, 1 jigger of Old Overholt rye whiskey, and 3 generous dashes of Peychaud's bitters. you can substitute Angostura bitters as if it is all you can find, but Peychaud bitters is traditional. Stir the Rye mixture with the ice until well chilled. Do not shake with the ice as it will dilute your cocktail. Strain into the Herbsaint-coated cocktail glass. Twist a lemon peel over the drink to release the essential oil in the peel. Drop the peel in the glass and serve. This is an outstanding cocktail. You should approach it reverently. Take the time to appreciate the beautiful perfume that this blend of ingredients exudes. It smells delicious. Anise, spice and a complex floral component from the Herbsaint create an aroma that is heavenly. At first sip you will feel the warm burn of the rye, but then layers and layers of flavor. There is the sweet flavor of honey and spice, a taste of the bitters balanced perfectly by the sweetness of the simple syrup. The lemon twist is the icing on the cake adding both a flavor and aroma component. It is amazing how much the Herbsaint adds to this cocktail. Although the glass is only coated with this elixir, the personality of this cocktail can be attributed to its presence. It is important that this cocktail be served without ice. The personality of the drink changes as the cocktail warms. Savor it, sip it, but drink it slowly. You will be rewarded for your patience. 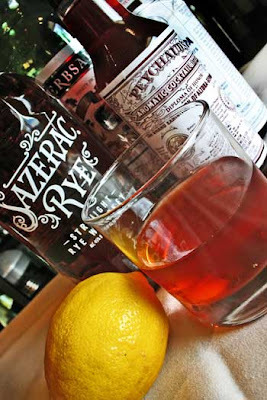 Every bartender I spoke with in New Orleans insisted that a "real" Sazarac will be made with Old Overholt Rye. Old Overholt is cheap, readily available and a staple at most New Orleans restaurants and bars. Herbsaint is also easy to find in New Orleans, but a bit more difficult in other parts of the country. I assure you it is worth the time to find some, or have some shipped for you home bar. I have included links at the bottom of this review if you would like to order all of the ingredients by mail. If you are in a pinch, you can substitute Pernod for the Herbsaint and cognac for the rye. The best Sazarac I had in New Orleans was prepared at Herbsaint Restaurant on St Charles Avenue. There will be those that will disagree, but that it the beauty of reviewing. It provides a forum for discussion. Do you have a favorite bar or restaurant to enjoy this New Orleans staple? Share it with me in the comments. I am already starting a list of places to visit for my next trip to the Crescent City. Did I mention the people of New Orleans? I was so impressed with everyone I met there. 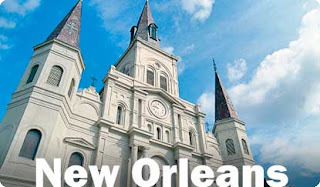 The wealthy, the working class and the poor...the spirit of New Orleans was instilled in all of them. After being battered by Katrina in 2005 all of New Orleans has come together. The residents diligently work to preserve the culture and tradition that has been so richly celebrated in New Orleans for many generations. I made it a point to speak to many of the residents during my 3 days there. ALL of them were incredibly generous with their time, and truly went out of their way to give me hints of where to go and what to see. I am kicking myself for never making it to New Orleans before now. I packed two weeks of eating, drinking and touring into a 3 day trip. I will have to go back two or three more times to visit all of the places that remain on my list to experience. The running joke while in New Orleans was the question of which would give out first, my liver or my waistline. Look for all of the gory details in my future reviews coming later in the month. Laissez les bon temps rouler! 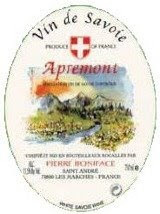 Pierre Boniface Apremont "Vin de Savoie"
Savoy, France / $14 "Great Value"
It is difficult to believe that Summer is over. My kids started school again last week and it is impossible to believe how quickly time flies. I am going to miss the warm summer nights when the cool autumn nights take their place. There is nothing better then sitting on the back porch with Diana Krall on the stereo and a chilled bottle of white at the ready. Usually my favorite wine to sip on these nights is a lighter white wine. Typically I will lean towards a Vinho Verde from Portugal. I was asked to taste this wine for review and was really impressed. So much so, I went out an bought a case for what is left of my annual porch time. This wine is from Savoie (Pronounced Savoy) which is in the eastern part of France. 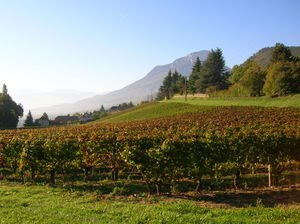 It is made by Pierre Boniface using the Jacquere grape which is common in the Savoie region. This region is at higher elevation and the wines have an interesting Alpine character. This wine also has an effervescent quality, similar to a vinho verde. The wine is light in color with a nose of flowers, mineral, melon and bit of spice. The wine has wonderful body. It is smooth and denser then you may expect for a white. There are clean flavors of melon and pear and at the end a tidbit of grapefruit peel on the long finish. . This wine is a terrific value. It is easy drinking and surprisingly inexpensive for what the wine delivers. It has a different profile then your everyday Pinot Grigio or Chardonnay, and is worth your time to taste. Since I tasted this wine I have introduced it to many of my wine geek friends with great results. Be the first in your group to introduce this delicious and inexpensive varietal. This wine is widely available. Check with your local wine shop to see if they can get it. There is also a premium version of this wine which has a metallic gold label. The premium bottle is called "Prestige". This wine has a bit more depth, and is certainly worthwhile. Try them both and let me know what you think!